Low prices. OrangeSmile.com offers car hire service in Faroe Islands on the lowest-rate-guarantee basis, since we work with car suppliers directly. For your search criteria in Faroe Islands, we always select and show the best rental offers. The car reservation process consists of 3 simple steps: (1) search for available cars for your dates in Faroe Islands; (2) select your car type; and (3) fill in the booking forms. Once the reservation is completed, you will receive a confirmation voucher to your email address. During the booking process, please check your rental conditions. To pick up your car at the rental point in Faroe Islands, you need to provide our confirmation voucher, your driving license and a valid credit card. The final payment is normally carried out at the pick-up point. Our car hire points in Faroe Islands accept VISA, MasterCard, etc - please check your rental conditions. At the pick-up point, please read the handling manual and check the car for present defects. 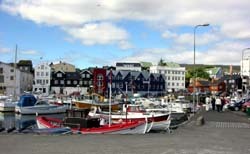 OrangeSmile.com wishes you a pleasant journey to Faroe Islands! The car hire reservation system OrangeSmile.com allows renting a vehicle in Faroe Islands within 10 minutes. Our largest database of car suppliers enables us to provide you a rental car in Faroe Islands at the cheapest rate ever possible. At rental locations in Faroe Islands we offer the following car sizes: mini, compact, economy, standard, premium and luxury. The following car types are available in Faroe Islands: Sedan, Hatchback, Jeep, Cabriolet, Coupe, Minivan and Minibus. The history of the Faroe Islands started yet in the 9th century, but only in the 20th century the islands became independent and nowadays are considered one of most popular resorts of the Atlantic. Every island has its unique signature places, landmarks and excursion programs. The city of Torshavn is the capital of the islands. The city is located on Streymoy, the largest of the Faroe Islands. The centre of the city is the location of two interesting sights of medieval architecture – Munkastovan Monastery and Vesturkirkjan. The first building was constructed back in the 15th century and miraculously managed to survive during a large fire in 1963. The island is also home to the largest culture centre of the islands – the Museum of History. Its halls exhibit collections of religious artefacts, archaeological findings, industrial instruments, agriculture tools, navigation tolls and other items used in manufacture. There are several cosy villages on the island, and every of these villages has its own unique legends and traditions. For example Leinar Village is famous for its beautiful nature, while Kirkjubour attracts travellers with its magnificent old churches. Many tourists arrive to Nolsoy Island to enjoy its beauty and see a large collection of ancient artefacts that is exhibited in halls of Brunn Historic Museum. Take a short boat ride to see a tiny island of Hestur. It takes only 10 minutes to reach it, but the reward is truly wonderful – amazing bays and grottoes, spacious beaches and not many people around. Faroe Haven is considered the main attraction of Hestur Island, and Kalsoy Island attracts travellers who come to see its beautiful caves. The northern part of the island is the location of Koldur Lighthouse, which is equipped with an observation deck. If the weather is fine, it’s possible to see Cape Enniberg and several small islands. Borðoy Island is a popular tourist destination due to numerous attractions and entertainment that the island offers to its guests. There ancient religious buildings, old brewery and picturesque haven on the island. Finally, Fugloy Island will amaze guests with its high rocks and cliffs, which have become the favourite destination of mountain climbing fans. When making a reservation of a jeep or a premium car, please check the rental conditions carefully – quite often car rental offices in Faroe Islands require two credit cards for luxury cars. The examination of off-road cars should be particularly careful. SUVs in Faroe Islands are usually used in difficult road conditions, so the probability of unmarked chips and scratches is quite high.